Three kinds of rock can be seen from this scenic viewpoint. On the left hand side is darkish grey Triassic limestone around 230 million years old. This marine sediment is in contact with brown ophiolite; which comprises most of the rock that can be seen on the far side of Wadi Al Kabeer and extending out toward the ocean. 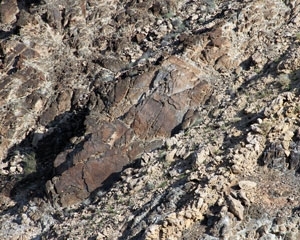 The ophiolite is a igneous rock that was originally part of the oceanic crust. The ophiolite started to surface from around 90 million years ago, when a large movement of all seafloor-layers towards the Arabian plate caused them to fold and break as they traveled more than hundreds of kilometres from the ocean to Oman’s coastline. This process continued for around 20 million years. After formation of the ophiolite erosion took place. Additional movement of the plates around 60 to 70 million years ago caused the rock to be submerged; allowing further sediments to accumulate on top of the ophiolite in shallow seas. Later again the rock was uplifted and tilted. By looking closely to the hills in the distance and towards the right, on one of the hills the ophiolite is overlaid by a cap of covered by a yellowish cap of much younger Eocene limestone sediment around 50 million years old.